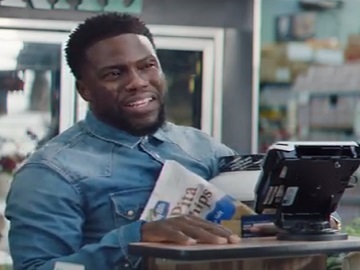 Chase has tapped Kevin Hart to promote its Freedom Unlimited credit card, which allows you to earn 1.5% cash back on everything you buy. The 15-second spot features the comedian in a grocery store talking to the camera while pushing the cart. “I work hard and I want my money to work hard, too. So I use my Freedom Unlimited card. Even when I’m spending, I’m earning 1.5% cash back on everything I buy,” he says, showing his card. He then tries to grab his favorite soup, but doesn’t manage to do it because it’s placed on the top shelves and it turns out he’s not tall enough to reach it. “With Freedom Unlimited you’re always earning,” the voiceover says at the end of the commercial, which also sees Hart taking another can of soup instead when another customer shows up in the aisle. Kevin Hart, who was supposed to host the Oscars this year, but won’t do it following a controversy (he stepped down after homophobic tweets from several years ago surfaced), has signed a multi-year deal with the bank to star in a series of events, workshops and video spots to promote financial awareness and the Chase Freedom Unlimited credit card. Chase, which works with agencies Droga5 and VaynerMedia, also has Serena Williams and James Corden as brand ambassadors.